Ask a candidate for local council what they stand for and they’ll usually read off the same old script: life long local, supports better amenities for the area, and opposes over-development. Invariably, this opposition to over-development often turns into opposition to almost any sort of development at all – NIMBYism at its purest. And when everyone is a NIMBY (not in my backyard) what you get is BANANA (build absolutely nothing anywhere near anyone). Building nothing is certainly an option, but it soon results in a housing shortage which pushes housing prices up across the board. This in turn results in housing affordability issues, often for the most vulnerable in society: the poor, the young, the old, the migrants, etc. So building nothing is not really an option, we need to build something. So the question is not should we build, but where should we build? Should development happen where it is most beneficial, or where there is the least political resistance? 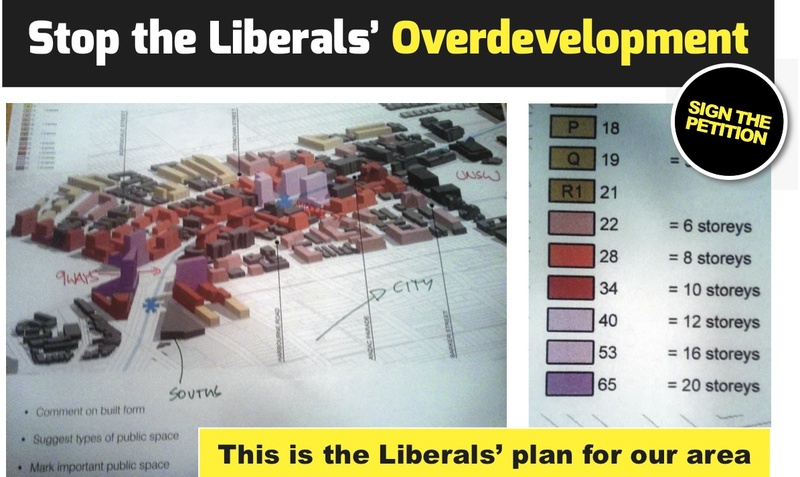 This brings us back to the NIMBY, because they want development to happen in the latter, rather than the former. Really we should be pushing for concentrated high density development in and around activity centres with good commercial, job, and transport links. This in turn would allow the remainder of the metropolitan area to remain protected with its low density village environment maintained. Some good recent examples of each are the leaked proposals to dramatically increase densities around Kingsford (g00d) for when the new light rail line comes through in a few years and to allow “Fonzie flats” in low density suburbs (bad). The Kingsford plans call for buildings of up to 20 storeys in Kingsford, doubling the suburb’s population through the addition of 30,000 additional dwellings. The area is right next to a major university, has a commercial zone along Anzac Parade with shops/cafes/restaurants/pubs, and will soon have a light rail line connecting it up to Central and Circular Quay. It is the sort of area which has a vibrant atmosphere, walkability, and plenty of jobs. It is exactly the sort of area where you want to pack in as many people as possible, in order to ensure that as many people as possible have access to the sort of good infrastructure, good jobs, and good living environment that exists in this area. Some locals won’t be happy, and it is this sort of unhappiness that the now local MP tried to tap into at the recent federal election. But if these new dwellings aren’t built here, or somewhere similar, then they will need to be built on the city fringe or as infill development in existing areas that lack the infrastructure that places like Kingsford have. The option of building on the fringe is slowly drying up, as it isolates residents from jobs and other services, while eating away at the Sydney basin’s limited remaining farming belt. As a result, it is unlikely that this will continue much beyond the current North West Growth Centre and South West Growth Centre. That leaves infill development in low density suburbs, like The Hills in Sydney’s North West. The “Fonzie flats” proposal, studio apartments built over garages, mentioned above is an example of this. Granny flats are another. 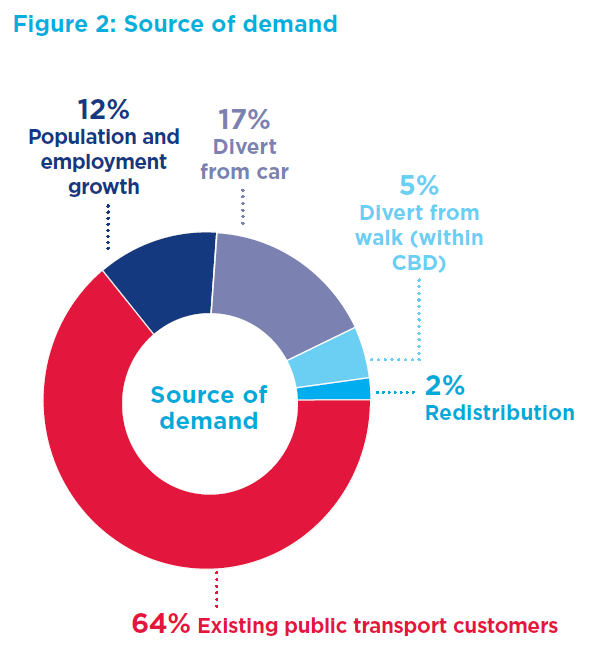 But adding population to parts of Sydney that are not suited to large amounts of road traffic will only backfire when all these people take to their cars due to the lack of walkability and good public transport. These are the very things which places like Kingsford have, and why it is more suited to take on additional population. But if development proposals there are rejected, then it only pushes the development over into less suitable locations. And that is definitely development done wrong. NOTE: This post was accidentally published for 26 minutes on the morning of Wednesday 20 November, before this next section was written. The need to have greater densities for infill development does not mean that developers should be given a blank cheque to just do as they like. In fact, governments should (and often do) trade off these higher densities in exchange for something else from developers. This may be additional public space, more units with rent set below the market rate, contributions to building essential infrastructure to support higher density, etc. And there is absolutely a role for community consultation to improve development and ensure it fits in with the surrounding community. It is not, however, something that should be used as a backdoor way of preventing development from going ahead. When addressing residents of Surry Hills about the light rail down Devonshire Street earlier this year, Sydney Lord Mayor Clover Moore raised the Eastern Distributor as an example of community consultation being a force for good. While initially opposed by many locals, consultation and community feedback resulted in the revitalisation of streets like Crown St and Bourke St, previously traffic arteries, into quiet and livable places now that major traffic had been moved to the Eastern Distributor. It allowed for the future creation of the Bourke St cycleway, and turned Surry Hills into the village it is today. The Urban Activation Precinct plan by the state government has the same potential. With constructive community consultation, the increased densities can act as enablers for better transport infrastructure, improved public spaces, and a more active community. What it can’t be, is an avenue for local special interest groups to block the development that Sydney so desperately needs for its younger generation to be able to afford a home of their own. Coogee and all suburbs South of Maroubra would lose direct bus access to the CBD outside of peak hour if the bus network redesign proposed as part of the CDB and South East Light Rail (CSELR) Environmental Impact Study (EIS) were implemented. 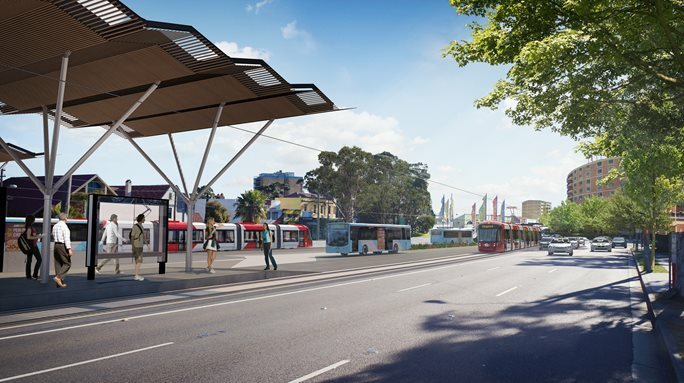 The new network would instead operate with feeder buses to light rail interchanges at Kingsford and Randwick where passengers would make a cross platform transfer to a tram in order to continue their journey into the CBD. Some buses will terminate shortly after these interchanges, but the majority will be re-routed to form cross-city links to destinations like Edgecliff, Sydney University via Redfern/Central, or Sydenham via Mascot. 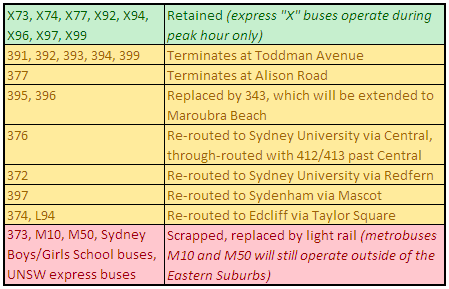 A few bus routes (such as UNSW express buses or the 373) will be elimiated entirely when their proposed routes would overlap entirely with another proposed route, while the M10 and M50 metrobuses will lose the Eastern Suburbs portion of their route. Peak hour express buses that operate via the Eastern Distributor in the morning and Elizabeth Street in the afternoon will continue as normal, and the bus road along Anzac Parade and Alison Road will be retained to allow them to continue to travel through that portion of their route separated from private car traffic. The new network operates will operate on the basis of connections involving trips on multiple vehicles, rather than direct journeys on a single vehicle, and will be hindered if frequencies are insufficient or if fare penalties remain for transfers for bus to tram or vice versa. 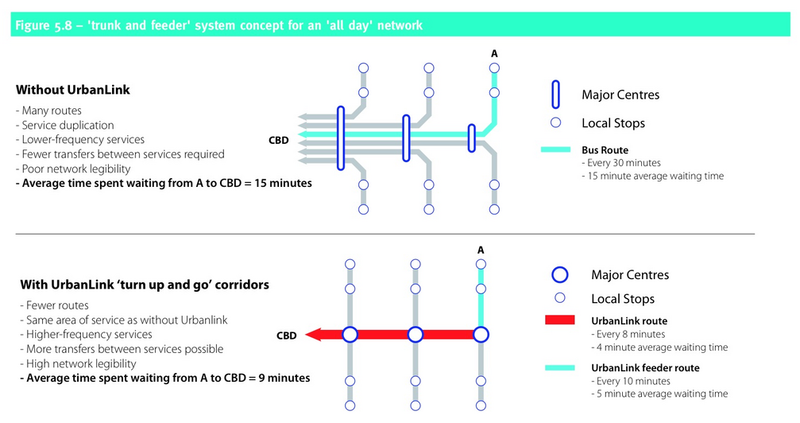 However, if these two obstacles are not in place, then it will provide an improvement on the existing network, which provides good connections for anyone travelling to or from the CBD during peak hour, but often falls short for anyone making a cross-city journey or travelling outside of peak hour when frequencies generally drop to half hourly. Light rail will produce $4bn in benefits, while its estimated travel times have been revised downward according to the project’s Environmental Impact Statement and associated Business Case. In addition, a cut and cover tunnel has been confirmed for Moore Park. But most of the content in these two documents had already been released to the public. Travel times previously estimated at 24 minutes between either Randwick or Kingsford and Sydney’s Central Station have been revised to 15 minutes from Randwick and 18 minutes from Kingsford. The travel times had been criticised for being longer than existing travel times on buses, particularly considering the additional travel time required for passengers required to make a transfer from bus to tram (or vice versa) as part of the planned bus network redesign. However, the new estimated times mean that travel to Central would now be faster by tram than is currently the case by bus, and also more reliable given that trams will travel the whole way entirely segregated from traffic, while existing bus routes must share some or all of their trip with private vehicles and can thus end up delayed in general traffic. While trips from Randwick to Circular Quay will be faster by tram than bus, trips from Kingsford to Circular Quay may remain faster by bus. Transport for NSW (TfNSW) has also announced that light rail will cross Moore Park via a cut and cover tunnel. This was the preferred options for both TfNSW and in community consultations, but may result in a slightly longer journey as it requires an at grade crossing on South Dowling Street, whereas the viaduct option was a grade separated crossing over South Dowling St. The Business Case finds that the light rail line will produce $4bn of benefits and cost $1.6bn to build, providing a Benefit:Cost ratio of 2.5 or $2.50 of benefit for every dollar invested in the project. It will also attract 76% of its patronage from existing or future public transport users, but also attract 17% of its patronage from car users, helping to take cars off the road. 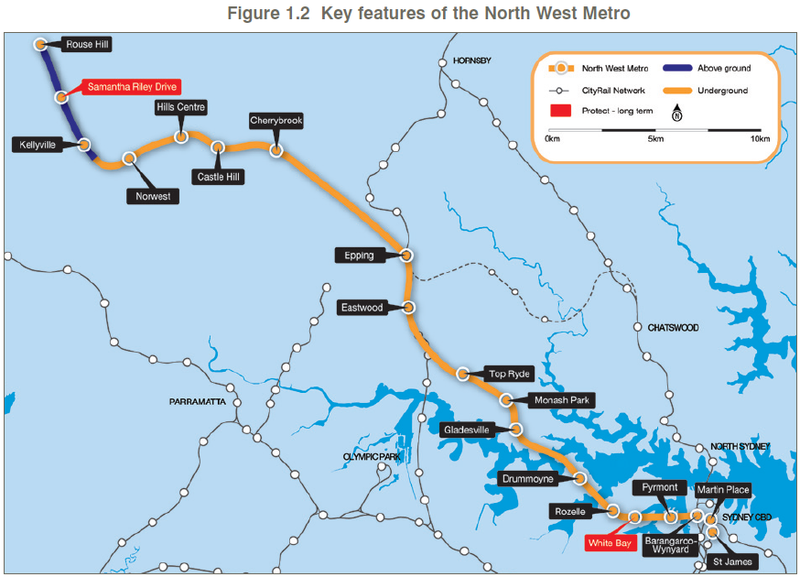 The recent post on how the SWRL might work received a lot of comments, which soon went on a tangent about the North West Rail Link (NWRL) and the now abandoned plans for the North West Metro. The final EIS for the North West Metro is available here (thanks to Ray). 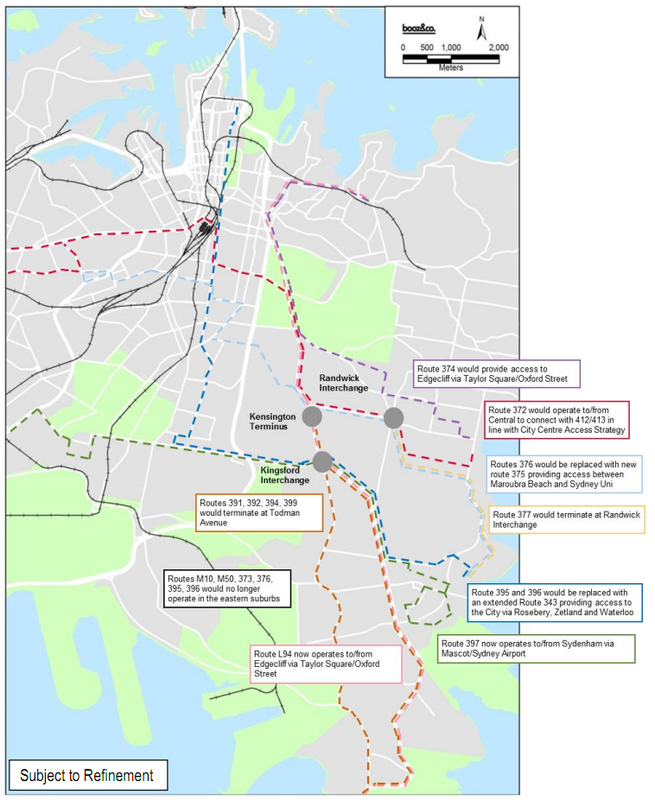 “Although I don’t subscribe to the “metro” conversion strategy, I would have thought that the Inner West Line to Homebush would have been more of a priority than the IIlawarra Local Line to Hurstville, particularly when you consider the ramifications of compromising East Hills Line services from the south west. “Why don’t they just commission the private sector to build a new harbour tunnel(allowing the company to charge juicy toll’s) and THEN convert some lanes on the bridge to heavy rail? “I am pretty sure the cheapest option would be to build the second crossing as Bradfield intended, the eastern lanes of the bridge into Wynyard 1 and 2. However, if you believe the Government that the bridge itself is limited to 26 tph in Single Deck form and 20 tph in Double Deck form then its not going to be able service the potential of the Single Deck NWRL on its own let alone service two lines, you would need three crossings at least and to stop short many services. We are struggling to get a second crossing built so I cant see three being built for a long time so its obviously time to look at either a new line running under the bridge or an under harbour tunnel. A Northern Beaches line would also have much worse grades than the NWRL/ ECRL has, it requires a serious slippery dip to get through the spit area, plus it has a catchment that suits turn up and go services and thus it makes sense to be a Single Deck line. “the detailed submission the Inquiry received from Australian Infrastructure Solutions Ltd proposing the under-bridge proposal indicated that it would be feasible to install two or even four additional rail lines which would sit within the supporting girder structure with relatively minor modification and that the Bridge with the recent strengthening of the hangars could take the extra weight. In fact I understand an earlier version of this proposal involving road lanes was developed and nearly adopted by the Carr government, but they got cold feet at the last minute, partly because of the incorrect perception that this was going to stretch all the way across the width of the bridge. Further comments can be made below.